Her mom’s chicken recipe opened the door to franchising for this young entrepreneur, who is a lawyer by profession. The story of Manang’s Chicken is inspiring for any food vendor in a bazaar or tiangge. With just P10,000 in capital , Jill Gerodias-Borja tried her luck at the Mercato Centrale food market in Taguig City by buying an electric tabletop fryer, uniforms for three people, and ingredients for her mother Marissa’s twice-cooked, deep-fried chicken recipe. Their fried chicken proved to be an instant hit. 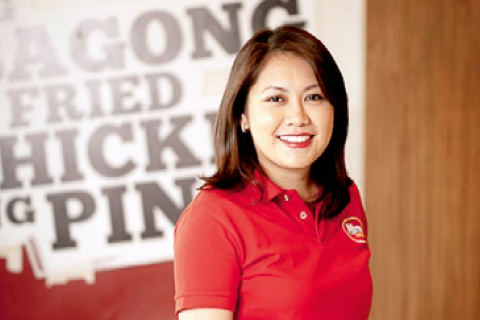 “Since my family and I had always thought our chicken recipe was good enough to sell, but no one had the time to make a serious business out of it, I decided to sign up and give it a shot,” says Borja, now president and chief executive of Giabella Foods Corp., which operates Manang’s Chicken. Just a few months later or in June 2011, Manang’s Chicken opened its first restaurant in Ortigas, Pasig City, using P1.5 million for the venture. Jill’s sister, Chef Jen Gerodias-Slagle, developed Filipino-inspired comfort meals to expand its menu. Being a lawyer by profession, Borja struggled with Manang’s day-to-day operations, having no prior experience in the food business. “I had to learn on the job how to run a restaurant,” she admits. Seminars, a lot of reading, and advice from friends helped her get through it. Manang’s target was to have over 100 branches in three years, and be in the same competitive level as the big fast-food chains. If their instant-hit status from Mercato is any indication, that would easily be achieved.